Capcom: still making games for all platforms! This picture comes to us by way of 1up… and it shows just how out of hand console fanboys can get sometimes. 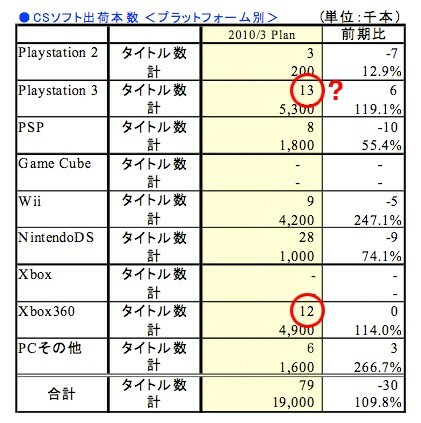 It also shows what appears to be a proposed number of titles developed for 2010-2013. The last few days I’ve been reading articles on how the PS3 is Capccom’s new platform of choice. Some articles suggested they were swayed by the incentives package recently proposed by Sony, offering PSN developers a bigger cut of the sales. Another article suggested that the PS3 had a large line up of exclusives, and the Xbox 360 would be getting some table scraps. Countless websites were making it sound like Capcom was abandoning the Xbox 360 and intended to become a Playstation-centric developer. A lot of focus has been placed on the numbers: 12 to 13. Everyone wants to know what the ONE PS3 exclusive title will be. How soon we forget. Articles like that, which will popup continually throughout the day, suggest that the other 12 games will be the same on both platforms. First of all, both of these platforms will be getting a plethora of attention from Capcom, so I don’t think anyone needs to worry about what game to play in the next few years. Some websites suggest that also includes titles from this year. If that’s true, consider this: Xbox 360 seems to have lost Dead Rising 2 exclusivity, and according to all accounts Dead Rising 2 will be multiplatform, PC, PS3, and Xbox 360. However, the Xbox 360 should be getting Lost Planet 2, which, at this time, is still considered an exclusive. PS3 and PC versions are likely in the works, but if it remains an exclusive, that is one less game they have in common. Which would mean two exclusive titles for the PS3 *gasp*! I know, it’s enough to make mountains crack… but why don’t we all just breathe in for a second and relax. Got that? Relaxed? Less tense? Good… now, why don’t we brainstorm how 8 “new” titles could possibly run on the Nintendo Wii? What’s next for them? Dead Rising 2: Chopping Spree?